Although botanically unrelated, white bryony and black bryony are very similar in appearance and share the same climbing habit and large underground tuber. Rapid growth can swamp plants they grow up so control is often necessary. Both white bryony (Bryonia dioica) and black bryony (Tamus communis) are strong climbers that can grow 3m (10ft) or more in a season. The weight of the stems can break down smaller shrubs and smother growth. White bryony (Bryonia dioica), is a scrambling climber in the cucumber family, Cucurbitaceae, developing several stems and producing greenish flowers in the summer followed by red fruits in the autumn. Black bryony (Tamus communis) is a member of the yam family, Dioscoreaceae, and is a twining climber. Insignificant spikes of small, yellow-green flowers are produced in early summer (May to July) and the conspicuous strings of red berries often remain on the dead stems throughout autumn. To distinguish between the two, white bryony has five-lobed leaves, larger flowers and tendrils, whereas black bryony has heart-shaped leaves, tiny flowers and no tendrils. Both types of bryony form a tuberous rootstock, initially small, but increasing over several years to form a very large tuber weighing, in the case of white bryony, perhaps several kilos. Bryony is often found growing in inaccessible situations among tree roots or in hedgerows, from seeds that have been dropped by birds. It may also grow under, or close to, large shrubs where birds perch, or along walls or fence sides. 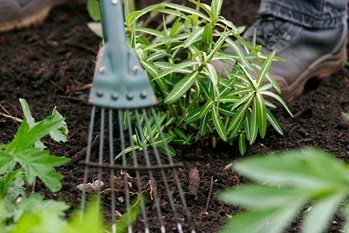 For seedlings A watch should be kept out as, in the first growing season, their tuberous roots can usually be lifted out easily with a hand trowel. For mature plants, the best approach is to dig out the tuberous root where the situation permits, tracing back the stems to the crown of the tuber which may be 7.5-10cm (3-4in) below soil level. Even if only some of the tuber is removed, this may be sufficient to prevent further regrowth. However, given the tendency for bryony to appear in tight spaces, digging out may not be an option. An alternative method is to lay the long, trailing, leafy stems, still attached to the rootstock, on a hard surface, such as a path or bare earth (not grass), then spray with the non-selective herbicide glyphosate (e.g. Roundup Fast Action, SBM Job done General Purpose Weedkiller or Doff Glyphosate Weedkiller). This should succeed in checking it, but there may be regrowth the following season. This weedkiller is best applied between July and mid-September rather than in early spring. As glyphosate is not selective in its action, it is essential to avoid spray or spray drift coming into contact with garden plants. If treating weeds in the immediate vicinity of garden plants, apply carefully using a ready-to-use spray in cool, calm weather or the gel formulation (Roundup Gel). Branches or shoots can be held back, using canes, or by covering or screening while spraying, but make sure that the weed foliage has dried before releasing branches or removing the covering.